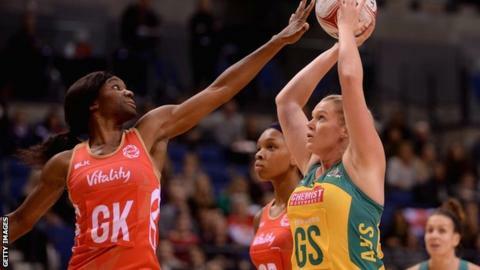 Australia beat England 60-44 at London's Copperbox Arena to take an unassailable 2-0 lead in the international tri-series. The world and Commonwealth champions were 58-52 winners in the opening match in Liverpool on Wednesday. And despite England leading by four goals at one stage on Friday, the Aussie Diamonds recovered to claim their second victory. The final match of the series is on Sunday at the Copperbox (18:30 GMT). Tracey Neville named an unchanged side from Wednesday and after going 5-0 down early on, England recovered to go in level at the end of the first quarter. The Roses found their stride and opened up a four-goal lead, but Australia fought their way back into the contest to go in 25-23 at the break. Neville brought on newcomers Laura Malcolm and Natalie Haythornthwaite at half-time, and her team were soon cut adrift by the world number one side who eased to victory.